Taipei 101 is Asia’s tallest skyscraper with 509 meters tall. It was designed by Taiwanese renowned architect Zu-Yuan Li (lǐ zǔ yuán 李祖原). 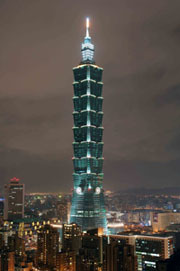 Taipei 101 is the landmark in Taipei City and was designed based on the Chinese lucky number 8. Comprising 101 floors, Taipei 101 has the world’s second fastest elevators that can travel 9 floors in just 37 seconds (nearly 64.4km per hour). Taipei 101 has parking lots from B2 to B4, shopping centers from B1 to the 4th floor, banks and financial centers on the 5th floor, business offices from the 6th floor to the 80th floor, VIP Club on the 85th floor, restaurants from the 86th floor to the 88th floor, an indoor viewing area of Taipei City on the 89th floor, and an outdoor viewing area on the 91st floor. Next to Taipei 101 is the Xinyi commercial district. Originally Taipei 101 was going to be a 66-floor office tower, a symbol of the new development emerging from Taipei’s financial district. A groundbreaking ceremony was held on January 13th, 1998, planners later decided to raise the tower’s height from 66 floors to 101 floors. Due to the height change, construction was delayed. The first column was finally constructed in the summer of 2000. On March 31st, 2002, five construction workers were killed when a 6.8 earthquake caused two cranes to fall from the 56th floor. Construction was halted and resumed after an inspection. Several fires in the podium occurred during construction as well. The roof-level topout ceremony was held on July 1st, 2003. During the week of August 10-16, 2003 it overtook the Petronas Towers in structural height, becoming the official world's tallest building. Visual confirmation was unavailable until August 22, however. The building formally opened on New Years Eve 2004, Taipei Mayor Ma Ying-jeou and Legislative Speaker Wang Jin-pyng cut the ribbon. Visitors where allowed to the observation decks, concerts where held, and on midnight the tower celebrated with a magnificent firework show. The building is also divided into eight distinct sections, with eight being a number associated with prosperity in Chinese culture. The internal architecture of Taipei 101 is similarly awe-inspiring. Pay attention to ornate details on the structural beams, columns, and other elements. 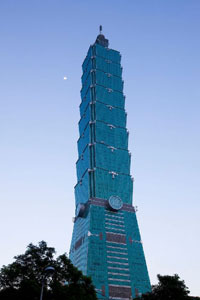 Taipei 101 is perhaps most notable for its feats of engineering. It was the world’s tallest building from 2004 to 2010, as determined by three of the four standards designated by the Council on Tall Buildings and Urban Habitat. It also boasts the world’s second fastest elevators, which will zip visitors up to the 89th-floor observation deck in a mere 37 seconds (cost: NT$400 for adults, NT$370 for kids under 12). It’s worth taking a ride up, as the views are stunning. The best time to visit would be in the late afternoon when you spend a couple of hours and see both day and night views of Taipei. You can also go up to the outdoor observatory on the 91st floor (note that while it's possible to go to the outdoor observatory in a wheelchair, the view is negligible, as the concrete railing is too high to see over). Don't forget to look toward the middle of the building, where you’ll see the world’s largest spherical tuned mass damper (one of three) that keeps the building steady. Attached to the tower is a large, up-scale mall. While the stores are unremarkable in that they offer the same brand-names as stores in other major cities around the world, the open and spacious design of the structure itself definitely makes it worth a visit. Located next to the cafes on the fourth floor is Page One Bookstore, which has one of the largest selections of English books in Taiwan. A supermarket specializing in imported food items is located in the basement. 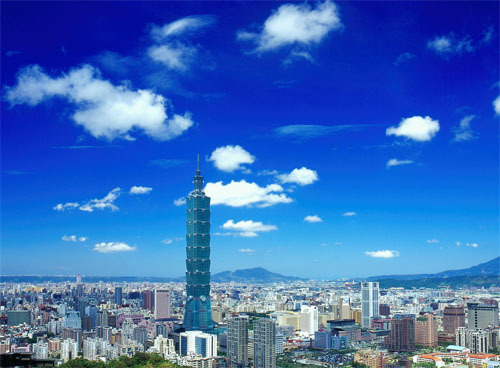 Transportation: Taipei 101 is a 15 to 20-minute walk from the Taipei City Hall MRT station. 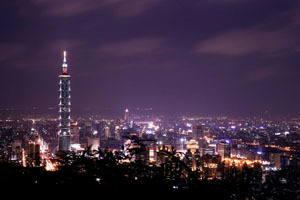 Travel Tips: You’d better get in the observatory of Taipei 101 before 21:15.